We’ve all dreamt of a futuristic home where every electronic gadget can be controlled at the touch of a button. Lights come on and off, meals get cooked, and chores get done. The market is now flooded with snazzy smart appliances. But let’s face it, they cost a pretty penny, and you don’t really want to mess around with complicated installation and learning how to use yet another device with more computing power than it took to get a man on the moon. We hear you, and the Belkin Wemo Mini Smart Plug is here to help. The Wemo Mini Smart Plug helps you control any appliance through your smart phone. With a price tag of just $35, it won’t burn a hole in your pocket. It takes no time to install, since it only needs to be plugged into a regular power outlet, and then you can plug your existing devices into it. It really doesn’t get simpler than that. And what does it do? It acts like a regular power socket, except it can be controlled via smartphone. Through the app, you can switch on or off any appliance that is connected to a smart plug. That means you don’t need to trudge downstairs to switch off the TV when your spouse has probably fallen asleep with it on, and your kitchen can start dinner while you’re out at lunch. How else can a smart plug help you? Read on to find out more uses for this clever little guy. Tumble driers cause a lot of house fires. Estimates claim that one fire a day in the UK and 3 per day in the US are caused by tumble dryers left on overnight. Experts advise that you switch the socket off to prevent that fire hazard. But let’s face it, you’re hardly going to make an extra trip to the dryer to check on it last thing at night. Save yourself the trip down to the basement by connecting it to a Belkin Wemo Mini Smart Plug, and setting it to switch off at midnight and save yourself the worry. 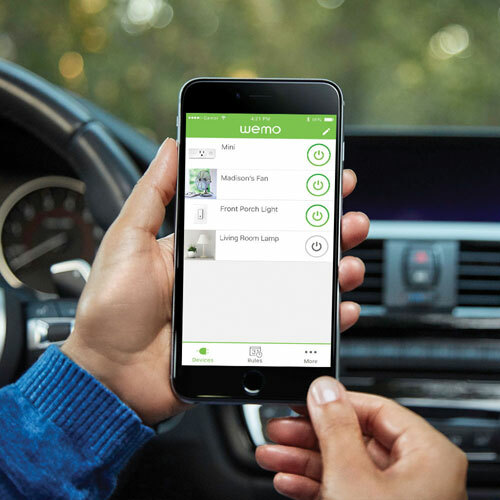 Hook up your music system to a Wemo Plug, to wake up to your favourite tunes rather than a boring alarm clock or a clock radio telling you about the state of the rush hour traffic that you’re not even bothered with. Connect up your coffee machine and toaster to a Wemo Plug each, which you can switch on remotely when you wake up, or set it up to start at a fixed time everyday. By the time you get down to breakfast, it’s piping hot and waiting for you. The Wemo app is so simple to use, yet gives you control of appliances all over your home. You could invest in an Anova WiFi Precision Cooker, or you could just connect your old crock pot to a Wemo Plug. That way, you can start the crock pot off while you’re on the golf course and come home to a hot meal after 18 holes. You’re reading your favourite book and you’re starting to drift off to sleep. And then, you need to reach out and switch off the lamp, which wakes you up, and then you’re stuck counting sheep. Well, you no longer need to stretch out of bed to switch off the lamp; instead you can set a timer on it knowing it’ll switch it off while you drift calmly off to sleep. If you prefer to listen to music as you drift off to sleep, you can also hook your music system up to a Wemo Plug, and have it switch off by itself later. We get it: you’re on that round-the-world cruise and your wife just can’t enjoy herself. You could be soaking in the sun in Bali, enjoying a vineyard tour in France, or admiring the Pyramids at Giza. But your wife keeps worrying if she left the stove on. Put her mind at ease; check your app, so she can relax! We all know that burglars are often scoping out easy targets like empty homes. Fool them while you’re out of town by switching on lights, the TV or the radio at random times from wherever you have an Internet connection. Sure, you can also do that with this Smart Lighting solution or a Smart TV. But with the Belkin Wemo Plug, you can remotely control any TV at all. About to return home? If your electric radiator is hooked up to a smart plug, you can start it before you board your flight home and the house will be nice and warm, just waiting for you. Certain smart devices like the Nest Thermostat sense when you’re home and change modes accordingly. The Wemo has an option to be paired with the Nest, so that when you’re home, it’ll communicate that to your smart plug. You can then program it to switch on the lamp in your entryway, so you’re not fumbling for the lights when you get home. Smart plugs like the Belkin Wemo Mini, TP-Link Smart Plug, MartinJerry mini Smart Plug, GYMAN Wi-Fi Smart Plug, Ankuoo REC or Yilen Wifi Smart Plug are effortless to install and will make your life much simpler. With these, all your appliances can be controlled via a smartphone without having to buy expensive smart devices.